Plant height: 2 to 8"
Foliage: leaves in a basal rosette; blades 2-3 times as long as wide; covered with reddish, glandular hairs tipped with mucilege. 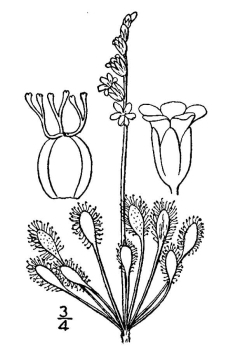 Witmer Stone, in 1910, wrote "This seems to be the most abundant and most generally distributed species of Sundew in South Jersey. 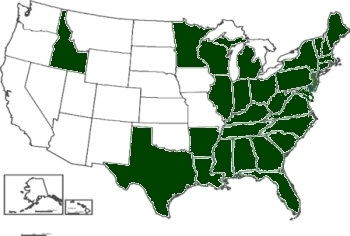 There is considerable variation in the size and appearance of the plants. Those of drier situations have a dense rosette-like cluster of small leaves from which the flower scape arises, while those growing in water or wet sphagnum develop a leafy stem often six or seven inches long; the uppermost leaves, from the midst of which the scape springs, being always the largest and freshest" (468). 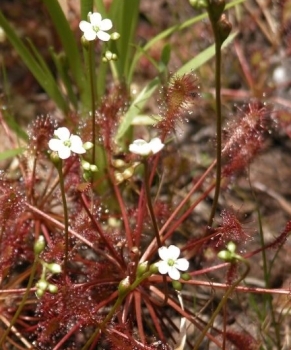 Blooms slightly earlier than Drosera rotundifolia. D. filiformous blooms earliest. Mary Treat of Vineland researched Droseraceae and corresponded with Charles Darwin regarding her research. For more information on this correspondence, visit NJ Pines.